Henry Pye was born in 1887 to Annie (nee Hayes) and James Pye (born 1837 and died 1886). Prior to the above - in 1881, James (a glass bottle maker) and Annie Pye were living on Sutton Road (now Rainhill Road) with their two sons, Joseph, aged 3 and James, aged 2 and their sister Mary Ellen aged 9 months. By 1891 James had died and Annie was living on Sutton Road with her sister and her husband. Annie was working as a laundress and her children were Joseph 13, James 12, Frederick 6, Henry 4 and Ellen 10 months. Later in 1891 Annie married James Platt. In 1901 the Platt family were living in Ellaby Road and Henry was 14 and by 1911 Henry was working as an engineering fitter’s labourer. Annie died in 1924 and is buried in St. Bartholomew’s Churchyard with her first husband and son Henry aged 33 who died in 1920 (after he returned from the war). Henry had joined the army in 1914 as Private 3085 in the 5th Battalion of the South Lancashire Regiment. He spent some time in Tunbridge Wells before travelling to France. It appears soldiers lived in empty houses and moved frequently. He wrote often to his family in Rainhill telling them that he spent most evenings in the Y.M.C.A. Henry was expecting Christmas leave in 1914, but it was cancelled. 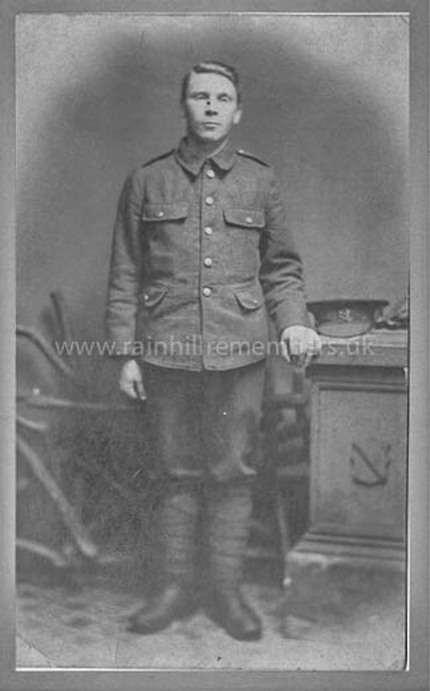 However he sent the menu of the Christmas Day dinner that was held for the British and Belgium soldiers in various halls throughout Kent home to his family in Rainhill. He also attended Mass in a small chapel. Once in France it appears Henry was wounded at Ypres on 9th May 1915. His notes say that he was of light complexion with blue eyes and he was transported home to the 1st Southern General Hospital in Birmingham. He must have later returned to war only to be injured again. This time he was sent to the 1st Western Hospital (now Fazackerly) on 28th August 1917. We do not know whether he ever returned to France. He was a prolific letter writer and sent many letters home and joined the National Federation of Discharged and Demobilised Sailors and Soldiers (St Helens Branch). 2 pairs Drawers Brushes - 1 Blacking.